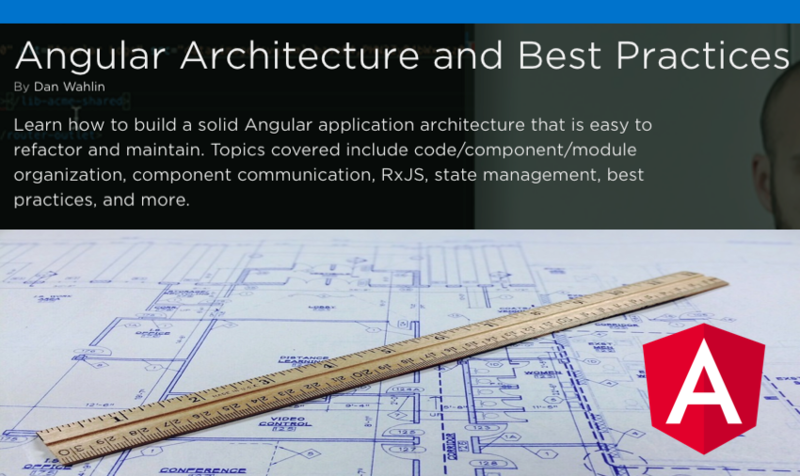 I’m excited to announce the release of my next course on Pluralsight titled Angular Architecture and Best Practices! The goal of this course is to provide you with solid, proven guidance to plan out your Angular application architecture, address various challenges that typically come up, and ultimately create a more maintainable and flexible application. Is there one “right” way to architect and build an Angular application? Short answer – NO! What are some key concepts I should consider when planning my application architecture? Is there any type of planning template I can use to help my team get started? Is it important to think through the organization of modules or should I put everything in the root module? What’s the difference between shared and core modules? How do I structure components? What if I have deeply nested components? How should I organize my application features? How do I communicate between components? What if I need to communicate across multiple levels of an application? What best practices should I be following throughout my application? Do I need a state management solution? What are some of the available options and how do they compare? What is an observable service and how would I create and use one? Can reference types and value types have different affects on my application behavior? How do I share code in my application? What if I need to share code between multiple applications? What’s an RxJS subject? Is there more than one type of subject? How can I use forkJoin, concatMap, switchMap, mergeMap, and other RxJS operators to make more efficient calls to the server? Where should I consider using HTTP Interceptors in my app? Is it OK to call component functions from a template? Are there alternatives I should consider? What different techniques can be used to unsubscribe from observables? What are some key security considerations I should be thinking about? There are a lot of questions out there about the core concepts of Angular, such as whether or not you’re following established best practices, how easy will it be to maintain and refactor the application in the future, how do I structure my features, modules, components, services, and more? Whether you’re starting a new application from scratch or updating an application, what application architecture should be used? In the Angular Architecture and Best Practices course you’ll learn about different architectural concepts, best practices, and techniques that can be used to solve some of the more challenging tasks that come up during the planning and development process. You’ll learn about a planning template that can be used to provide a simple and efficient way to get started. Discover different component communication techniques, walk through state management and code organization options. Finally, you’ll explore general best practices, performance considerations, and much, much more. When you’re finished with this course, you’ll have the skills and knowledge needed to think through the process of building a solid application that is easy to refactor and maintain. There’s a lot of thought and planning that goes into any application. While there are many opinions out there on how to architect an app, I hope the course provides you with additional insight into the process.